We taste thousands of products a year, and a few always stand out as “great for the holiday gift list.” Here’s the first of this year’s gourmet food gift lists. We also have a chocolate gift list, a stocking stuffer gift list, and others to come (spirits, food books and more). 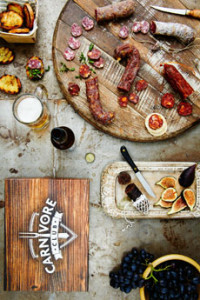 For foodies or meat lovers, Carnivore Club finds the most exceptional cured meats and packages them a gift box with an introduction to the artisan and ways to serve the items. The club delivery can be monthly, quarterly, bi-annually or just once. Each box has 4-6 selections of handcrafted meat, a total weight of approximately 18 to 28 ounces. Past selections have included meats as varied as biltong, duck breast prosciutto, Iberico ham, ‘nduja, water buffalo braesola and wild boar sausage. Satisfy someone’s inner carnivore at CarnivoreClub.co (yes, it’s co, not com). Dean Bingham gets credit for the most creative chocolate Christmas trees this year: hand-stacked blocks of 70% cacao dark chocolate or 32% cacao milk chocolate that create the tree. The nonpareils add a Christmas lights effect. The artisan chocolates are all natural and are made in a nut-free facility. The large tree is 5.5” tall x 5.5” wide at the base (1 pound, 7 ounces of chocolate) is $29.50; small tree is 3.5” tall x 3.5” wide (7.5 ounces of chocolate, $17.50). Get your tree(s) at DeansSweets.com. eCreamery sells top quality artisan ice cream; but the real differentiator is the ability to create custom labels for each individual pints. Sure, you can leave the flavor as the title on the pint, e.g. Banana Toffee Praline Crunch or Chipotle Maple Bacon Ice Cream. 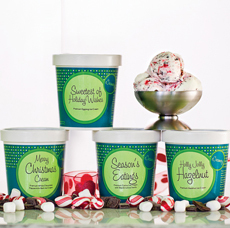 Nine holiday flavors, including the two previously mentioned plus Candy Cane Swirl, Gingerbread Cookie Swirl and others. Twenty year-round flavors—the basics plus Chocolate Cake & Brownie Bites, Chocolate Malt Ball and Sea Salt Caramel. There are five sorbets that are dairy free and vegan. Including overnight shipping in ice, four pints are $84.99, eight pints are $139.99 at eCreamery.com. BUT WAIT: There’s a savings of $15 off plus free shipping with code SweetNY15, through January 31, 2016 (shipped to one address). It still may be the most expensive ice cream you’ve ever bought, but it also will be among the most memorable. There are many recipes that call for wrapping a sausage with a strip of bacon. 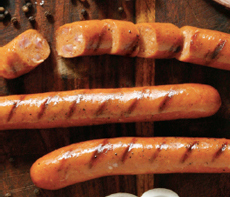 4505 Meats of San Francisco saves you the trouble: Bacon is embedded in its hot dogs. These creative sausage makers have loaded uncured hot dogs with uncured bacon, a recipe guaranteed to wow. A 3-pound package of 16 dogs is $33.00 plus shipping at 4505Meats.com. TOP PHOTO: A past box from Carnivore Club, featuring the charcuterie from Charlito’s Cocina. 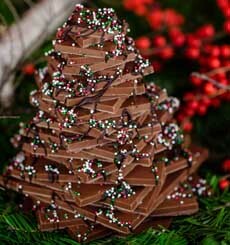 SECOND PHOTO: Chocolate Christmas tree from Dean’s Sweets. THIRD PHOTO: Bacon Hot Dogs from 4505 Meats. BOTTOM PHOTO: The finest ice cream with labels customized by you, from eCreamery. TOP PHOTO: A deluxe fruitcake from Robert Lambert. SECOND PHOTO: Whipped Honey With Cinnamon From Savannah Bee. THIRD PHOTO: Tonnino’s Ventresca Tuna, made from sashimi-quality tuna loins. BOTTOM PHOTO: Valrhona Hot Chocolate at Sur La Table. Robert Lambert has long been a great food artisan, who uses the bounty of local California heirloom fruits and nuts to make his creations. He crafts our favorite fruitcakes, pricey but worth it, orchestrating a memorable symphony of flavors unlike anything you’ve ever imagined. 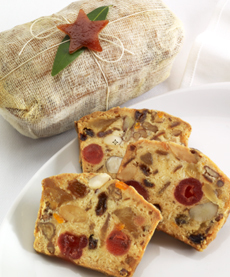 There’s a white fruitcake and a dark fruitcake; the difference is the mix of hand-candied luxury fruits and the spirits. White Artisan Fruitcake has light-colored fruits: golden raisins, candied bergamot, coconuy, Rangpur lime, Meyer lemon peel, blood orange peel, Buddha’s hand citron and candied young ginger all contribute. Nuts include almonds, Brazil nuts, pecans and walnuts. Each cake is soaked in the fine French cognac, infused with herbs and spices, topped with a California bay leaf and candied white grapefruit peel star. Dark Artisan Fruitcake has dark fruits: dates, prunes and dark raisins, hazelnuts, pecans and walnuts. The cake has a touch of molasses and brown sugar, the spices are cardamom, cinnamon and nutmeg. The cake is soaked in his favorite 10-year-old Ficklin port. The one pound fruitcakes are $55 each, or any two in a gift tin for $100, at RobertLambert.com. Our favorite honey producer, Savannah Bee spins together crystallized honey and aromatic cinnamon, forming an irresistible and spreadable Whipped Honey With Cinnamon. There are two sizes: a 12-ounce jar ($16.55) and a pair of two 3-ounce jars ($6.50). Another favorite holiday gift is Winter White Honey. From the Idaho Rockies, it is creamy, smooth and spreadable with natural finishing notes of cinnamon. This white-hued honey with a bright red label is available in the 12-ounce jars ($12.50) and two three-ounce minis ($12). For the honey connoisseur—or anyone with a refined palate—Sourwood Honey Gold Reserve is the honey gift. The sourwood trees in the Appalachian Mountains blossom only in “vintage” years, when there’s plentiful sun and rain. The flavor of sourwood honey is big and complex with hints of maple and spice. With a large jar, there’s enough to spare for basting grilled chicken or pork tenderloin, as well as lavish in tea and on pancakes. Sizes range from 3-ounce minis to 80-ounce jumbos, $12 to $92. The popular 12-ounce size is available with an optional pump—no dripping honey. Some people buy the best of everything. In the case of tuna, that’s Tonnino tuna, so lovely it’s packaged in a see-through jar. Our local gourmet stores sell it for $8 to $10 jar, but on Amazon it’s just $5.99. “Just $5.99” may still have sticker shock for those who wait for sales of supermarket brands for 99¢, but for gifting, think outside the can! The large fillets stand tall in jars, very different from what’s packed into cans. And the flavor must be tasted! Even our brother, who waits for the 99¢ sales, acknowledged as much. We now have solved the problem of what to get the tuna lover and the health-focused. Tonnino varieties include Tuna Fillets With Capers And Garlic In Olive Oil, With Garlic In Olive Oil, With Jalapeño In Olive Oil, With Lemon And Pepper In Olive Oil, With Oregano In Olive Oil, In Olive Oil (plain) and In Spring Water. The top of the line is Ventresca, “the royalty of our gourmet jarred tuna.” It’s hand filleted from a small section of the tuna’s underbelly (sushi eaters, think toro). Even the olive oil is delicious! A jar in every flavor is a special gift. See more at Tonnino.com. 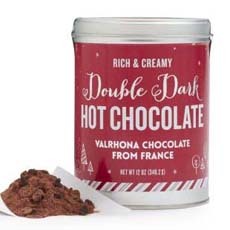 The first hot chocolate mix from master chocolatier Valrhona, one of the world’s great chocolate producers and the name for fine chocolate in France. A perfect blend of the finest cocoa powder and dark chocolate chips, it makes a rich, chocolaty, marvelous cup of hot chocolate. Exclusively at Sur La Table, a 12-ounce tin red and silver tin is $21.95. You can package it with Peppermint Cocoa Stirrers and Marshmallow Snowman Beverage Topper marshmallows for a more elaborate gift. Or, go whole-hog with a set of Peppermint Stripe Mugs. Find it at SurLaTable.com. Orders over $59 ship free with code SHIPFREE.